PORT-AU-PRINCE, Haiti (HCNN) — Haiti’s anti-drug unit said on Friday that several foreigners, including Colombians and Jamaicans, have been arrested and detained for alleged illegal drug trafficking as the Caribbean nation steps up efforts to fight drug dealers. 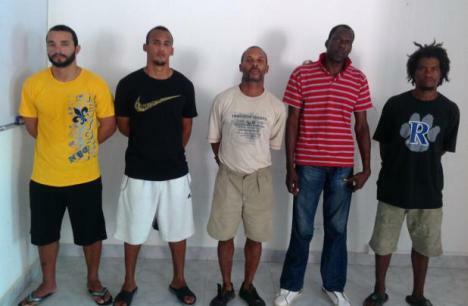 The deputy chief of the anti-drug brigade, Odelet Charles, said two Colombians, a Venezuelan woman and three Jamaicans have been detained on drug and money laundering charges, while two other Spanish-speaking foreigners, who claimed they are Cuban, but believed to be Colombians, are also in police custody. “Two Colombians are in jail while two others were extradited to the US, and three Jamaicans are also detained among other individuals,” Charles told HCNN on Friday. “We are redoubling our efforts to counter the activities of drug dealers. The means are limited but we are doing our best,” Charles said. During an operation conducted the past weekend near the southern island of Ile-a-Vache, Haitian anti-drug agents and coastguards, supported by UN soldiers, used three helicopters and three boats to chase and intercept two Jamaicans, Mark Reid and Fenton Johnson, and two Spanish-speaking individuals who identified themselves as Juan Rafael Hidalgo Manganelly and Alexis Leyva Moreno. A third Jamaican, Mark Pitt, was also arrested during a separate police intervention the past weekend. Pitt, who does not have proper documents, said he has been living in Haiti for a long time now. One of the Jamaican detainees, Mark Reid, confirmed to HCNN he was in contact with Damas Dominique, a man Haitian police officials described as a suspected drug trafficker. Reid, who claimed he was paid to transport two Cuban men to Haiti, denied any involvement in a drug deal, but without being able to say how he got in contact with Dominique who is living in Haiti. Dominique, who is now wanted by the anti-drug unit, has been arrested in the past on drug charges, but he was released under questionable circumstances by local judicial authorities, in the southern city of Les Cayes, police sources told HCNN. Police officials believe a deal was made between the Jamaicans and the Haitian alleged drug dealer but, since the drugs were not actually found, the occupants of the boat were held on illegal immigration charges while further questioning is conducted. Jamaicans often use small boats to ship marijuana to Haiti through the country’s southern coasts, which are very close to Jamaica. Haitian authorities also arrested a Haitian businessman, Evinx Daniel, who said he had called the police to invite them to secure an abandoned boat that contained 23 packages of marijuana, which apparently arrived from Jamaica. Daniel, who owns a beach hotel in the southern town of Port-Salut, said he was with three other people in his own yacht when he saw the vacant boat floating of the ocean. “Because I knew the drugs could have fallen in the wrong hands, we made sure it got to the shore and I am the one who called the police to come and get the packages,” Daniel told HCNN while in custody. “I thought I could be recognized as a hero for what I did because other people could have taken it, sold it or used it to destroy our youth,” he said. “I really don’t know why I am arrested,” he said. However, the prosecutor in Les Cayes, Jean-Marie Salomon, said since Daniel was in contact with drugs, his office needed to hold him for more questioning.